FROM KOREA WITH LOVE: (anti-clockwise) Map of Korea, four kinds of kimchi…altari or young radish kimchi, baechu or cabbage kimchi, baek or white kimchi and pa or green onion kimchi. 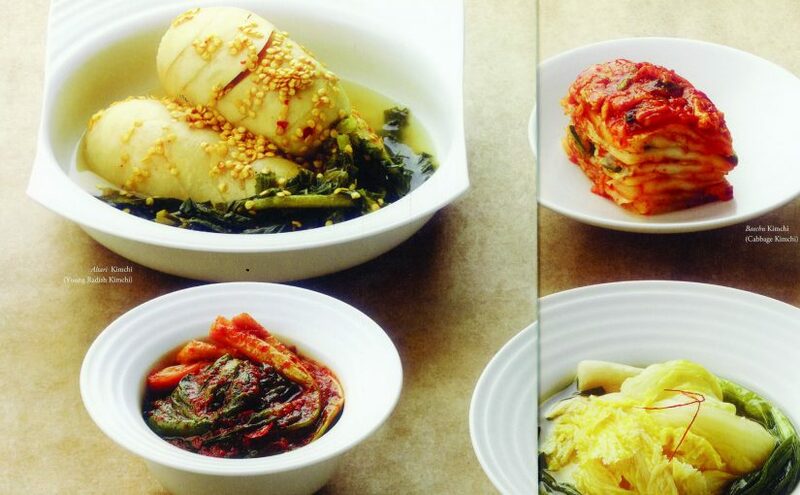 In Korea kimchi is said to enshrine a thousand years of culinary wisdom! WHAT do you know about Korea? Suddenly, post-IFFI, I’ve started taking a great deal of interest in Korea as in the Republic of Korea, that is South Korea, the democratic version as opposed to the autocratic, nuclear-driven North Korea. South Korea is the softer face of the two Koreas and Koreans and since Korea was the country of focus at this year International Film Festival of India and there were so many filmi Koreans down for a talkathon, making films in Goa/India, in Korea, etc…there was a special Imagine Your Korea pavilion set up at the INOX complex with delegates going in to check out if Korea should be their next holiday destination? Kimchi is the traditional fermented savory something magical served at home and in restaurants to guests, something guaranteed to make any bland main dish come alive with flavors. In Korea, I hear, young maidens are judged as matrimonial desirables if they could make kimchi good enough to satisfy ma-in-law! By now in our urban eating out scenario are familiar with kimchi or the various versions which turn up in oriental-styled restaurants and eateries. Most of us tend to recognize kimchi as a red hot chili-laced marinated chopped cabbage condiment or relish from Korea – it’s now a popularly served item number. It’s usually free on the house of course and to be indulged in while waiting for one’s main meal…in Korea there is kimchi and kimchi and so many varieties vegetarian and non-vegetarian, and the ponytail radish kimchi is to live for! Ponytail radish is what we see in Goa these days, the small alabaster smooth white fat sausage-styled radishes with glorious greens attached, which we so commonly see these winter months in our Goan markets. With any number of freelance veggie vendors wandering around with veggie loaded baskets on their head at Dempo Bhatt at Tonca (where I live nowadays), all wanting to sell bunches of fresh “mulo”Rs15-20 per bunch of four or five little ones. I really don’t know what Goans do with mulo but north Indian bhaile families in Goa turn them into sabzi (with roasted besan stirred in it) or turn them into grated radish-stuffed paratha; the south Indian sambar is very special with chunks of radish in it. There must be a radish chutney too…radish is supposed to be a great liver cleanser believe or not. I’m inclined to believe traditional folklore foodie wisdom and my newly made friend courtesy IFFI, Dawne Cressman, who lives an interesting alternate lifestyle, the kind I want to live, out at Patnem beach down south Goa. Dawne was staying in decent air-conditioned dormitory accommodation called Old Quarters Hostel at the heritage district of Fontainhas in Panjim, while attending IFFI films. She had nothing but praise for the hostel which offers reasonably economical accommodation and being an American, “The coffee they serve is the best, you come back and have some with me!” I accepted the offer for I have taken a shine to her. Anyway, better versed than me in alternate, healthier lifestyles (it’s also a mindset), she confirmed for me why fresh radish is a liver de-tox veggie, so take a fresh new look at the radishes arriving in our Goan al fresco markets, they’re “gauti” (organically cultivated I’m sure). When Dawne returned to Patnem beach she bought a whole bag full of radishes from Panjim from a local Fontainhas vendor to take “home”…learn to eat radish, she urged me, we are so lucky in India with all our fresh food! True. But to return to things Korean wish I could go to south Korea to take in dekho of their fresh food markets…interestingly, spicy kimchi is the national side dish and it may come along with another famous item number, thinly sliced and marinated grilled beef bulgogi; a fresh rice and veggies combo is called bibimbap, when in Korea you may also think ginseng chicken soup, samgyeopsal (grilled pork belly), tteok rice cakes, bibim-naengmyeon (spicy buckwheat noodles), gujeolpan is a platter of nine delicacies…then think japchae (stir-fried glass noodles and veggies), sikhye is a sweet rice punch, jeon are pan-fried fritters , sinseollo is a royal hot pot (whatever it means), tteokbokki or stir-fried rice cake. It’s a country of various kinds of rice cakes and these intrigue me. Especially sirutteok or steamed rice cake which is white rice and crumbled red beans rice cake. Apparently, sweetened red beans (small glossy red rajma) in Korean tradition are said to drive away evil spirits and misfortune…sirutteok is always served at funeral and family events. They also have a flower rice cake or hwajeon made of glutinous rice dough…and flowers to decorate food. Azaleas in spring, roses in summer and chrysanthemums in autumn…what are mugworts, must find out. One must learn to eat with a pair of chopsticks and soup spoons to eat less presumable! And this bit. The Koreans have quite a number of dining etiquette like meals may begin after the senior most person present picks up his or her chopsticks or silverware first; and always turn to the side if you’re taking a drink of something alcoholic in front of a senior…also do not drink soup directly from bowl, do not make noise when chewing, do not walk away while others are still eating and much more. Remind me one of these I must forget about everything and run away to Korea to drink barley tea (boricha) and green plum tea (maesilcha)…and may be buy back some red ginseng, called hongsam, this is Korea’s most popular health supplement, great for the immune system. All this and much more of course. Now to scheme up a way to go to Korea and take the hubby with me who of course will refuse to come, or may be not, but he won’t eat anything kimchi ! Why isn’t anyone promoting Korean or Cambodian fare in Goa? I mean all kinds of other fare from South East Asia is here, but not Korean and Vietnamese…or is there, let me know. Kimchi recipe coming up here next week … so keep watching this space !